This past Saturday, I was fortunate enough to take to the high seas with an audience full of little adventurers. Arden Theatre Company hosts a Children’s Theatre within their realm. Treasure Island is playing on the Arcadia Stage and has already extended their run through June 9th. Geared to children 8 and up, this charming story is full of fun for the adult kids too! 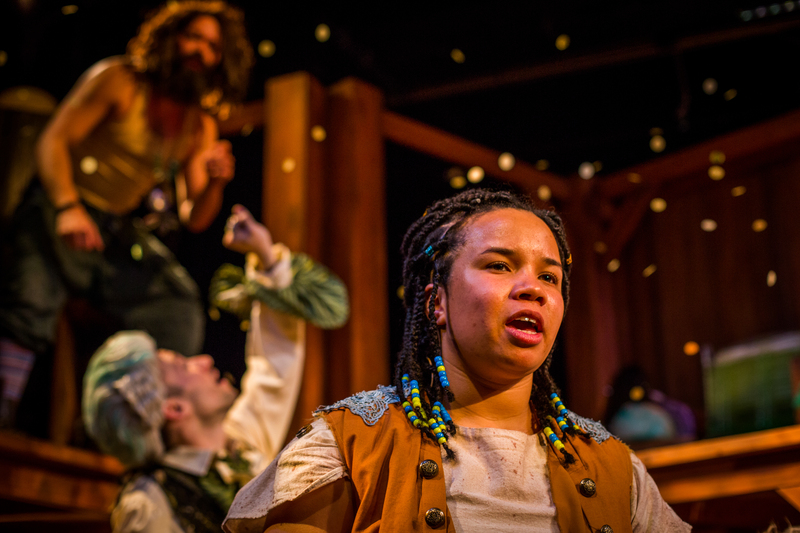 Based on the novel by Robert Louis Stevenson, Toby Hulse adapts a re-telling of Treasure Island through the eyes of an eager young girl ready to take on the world. Young Emily, as played adoringly by Eliana Fabiyi, greets us with violin in hand, practicing in her living room. Like all music does, she is transfixed and lets her imagination run wild as she transforms her living room into a giant pirate ship! Within her imagination she comes across five swashbucklers ready to take on any role she beckons. Jamison Foreman as One-Eyed Bart, Cameron DelGrosso as Captain Henry Payne, Robi Hager as Morgan Blood, Tai Verley as Jack Abraham in Arden Theatre Company’s Treasure Island. Photos by Ashley Smith, Wide Eyed Studios. Emily takes on the historic character of Billy Bones. We learn very quickly that this gender-bending production has an underlying message to empower young girls to be whatever they want to be. More importantly, this piece shows young boys there is no difference between “girl stuff” and “boy stuff”. Given the original story is chock full of characters, Arden casts a small diverse group of AEA and non-AEA actors of all ethnicities and genders to play the lot including Morgan Blood (Robi Hager), Jack Abraham (Tai Verley), Captain Henry Payne (Cameron Henry Payne), One-Eyed Bart (Jamison Foreman), and Mary Ann Evans (Mary Tuomanen). Don’t scoff at children’s theatre acting because this brothel of talent delivered on many levels. A particular standout is Hager who swaps characters of full voice, body, and movement with mastery. The real buried treasure is the original music by Alex Bechtel. The melodies are catchy and energetic. The downside is that there aren’t enough of them! Each actor also plays an instrument a time or two throughout. 3 people in one production play the accordion! Director Doug Hara does a wonderful job utilizing the dynamic set that Tim Mackabee designed. I definitely snuck a couple pics at intermission as inspiration for future productions of my own! Hara’s staging allows the audience to envision their own backyard playful antics and how you can manipulate any item into something if you simply dream it. Although not credited, the properties manager had a tall fete filling the space with toys and tchotchkes that intertwined the fantasy world with every day. I’m not sure I will look at brooms without seeing a musket ever again. Most children’s theatre productions are 60-90 minute one-acts. Treasure Island is presented in two acts with a running time of 1:40. A little on the lengthy side for younger ones, Hara adds fun interactive elements in the second act that keeps the little adventurers on their toes and engulfed in the story. Hence the 8+ recommendation. Not sure if all productions have a Q&A post, but this particular day they did. It was quick, interactive, and complimentary to the questioners. It is very clear that Arden takes their Children’s Theatre program very seriously from educating the youth audience to educating their youth artists. Previous Jess Conda, Jenn Kidwell, and Mel Krodman Give You “A HARD TIME,” Coming to FringeArts’ High Pressure Fire Service.